Controlled erosion encompasses abrasively drilling, grooving or milling a part. Micro-abrasive blasting is powerful enough to drill holes in ceramic substrates, yet gentle enough to cut slots in fragile silicon and glass wafers. MicroBlasting is “shockless,” generating neither heat nor vibration. 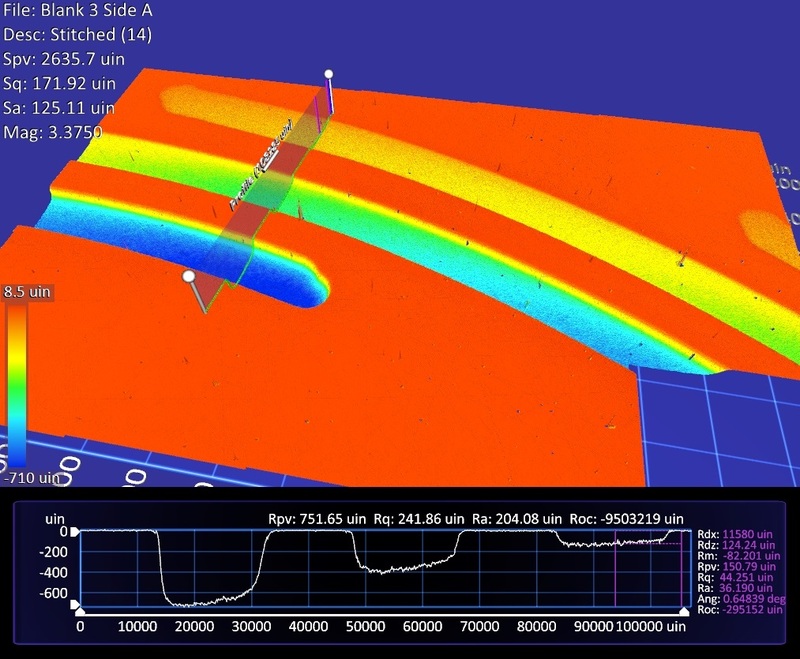 The blaster itself is a variable in controlled erosion applications. 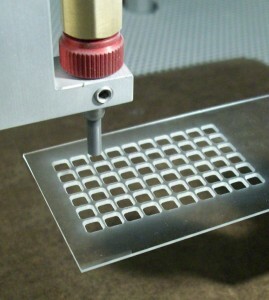 In order to control the erosive depth to 70 nanometers, a precise abrasive flow is required; however, not every micro-abrasive blaster supplies a consistent flow of abrasives. Even small fluctuations in the abrasive flow cause variation of particle velocities at the nozzle. Though imperceptible to the human eye, these variations result in the uneven erosion of a surface. All Comco micro-abrasive blasters feature our patented modulator system that feeds a precise and consistent amount of media into the air stream at 60 times per second. The most significant variable in a controlled erosion application is the composition of the substrate. Crystalline surfaces erode evenly and fracture along crystal interfaces. On the other hand, the ceramic part and the binder on sintered materials may erode at different rates. The ceramic may “pluck” from the binder, creating a large crater. 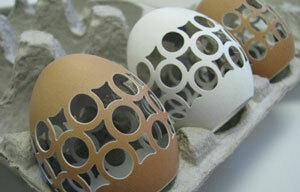 Over time this plucking results in a wavy surface finish. Type: The size, shape, and composition of the abrasive particle have the greatest impact on any MicroBlasting process. Aluminum oxide is great at cutting through hard, brittle materials. Sodium bicarbonate is a better choice against soft surface material because it cuts through the fibrous structure without “burning” the surface. Quality: Even subtle variations in size, distribution, and quality of abrasive particles significantly impact the end product. A bottle of carefully-sized sodium bicarbonate abrasive is not the same as your supermarket baking soda or the industrial abrasive supply equivalent. 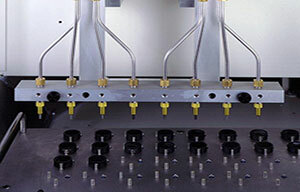 A human operator becomes a major source of variation when removing nanometers of material, so controlled erosion applications usually require automated platforms. Automation greatly extends the capabilities—precision, control, and repeatability—of MicroBlasting. Quantity: More abrasive in the air stream speeds up your process as long as each particle strikes the surface of the targeted part. Just like traffic jams, abrasive particles begin to slow down, crowd and hit other particles from behind once the stream becomes oversaturated. Velocity: Increasing media density decreases velocity. Every additional gram per minute decreases velocity by one meter per second. Higher pressure yields faster removal rates, but higher pressure creates a rougher surface. Direct machining is best when removing large, simple sections of material. 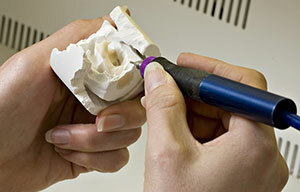 A small nozzle and accurate parts-handling capabilities work together to cut a pattern into the substrate. The focused abrasive stream prevents overspray, eliminating the need for a mask and reducing abrasive consumption. A metal or polymer photoresist mask exposes only the areas that require blasting. Sweeping the nozzle back and forth over the entire mask erodes fine layers of the exposed surface. Masking is common in applications with many small features. *The above approaches, direct machined and masked, can be applied in manual applications when tolerances are not critical and/or volume is not sufficient for automation. 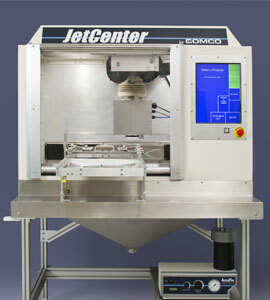 Bearing surfaces must run smoothly to meet new efficiency requirements in jet engines. 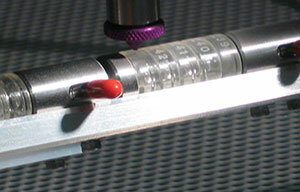 Precision channels etched into the surface of a ring create an air bearing. Any variance causes a wobbly bearing. These bearings are made from hard, brittle materials, so etching a flow path with a tolerance of 0.5 µm presents a significant challenge. MicroBlasting is surprisingly well-suited for this requirement, as it provides tight control over particle velocity and accurately controls etching depth. 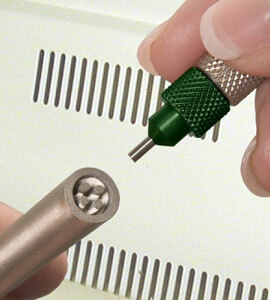 The ideal abrasive for this application is aluminum oxide. It is only slightly softer than diamond and able to cut through these hard surfaces easily. 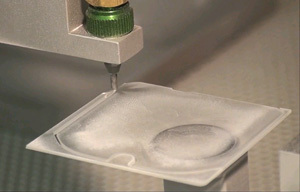 Our automated systems are able to monitor the abrasive stream for both quantity and consistency and feed these measurements back into the system to keep the etching rate constant. Silicon wafers incorporate both semiconductor and mechanical features now. The manufacture of ink jet printer cartridges is a good example of this convergence. 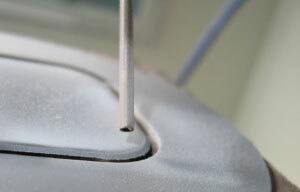 The via, or hole, that connects the ink reservoir to the individual nozzles is carved into the same silicon wafer that manages the signal. 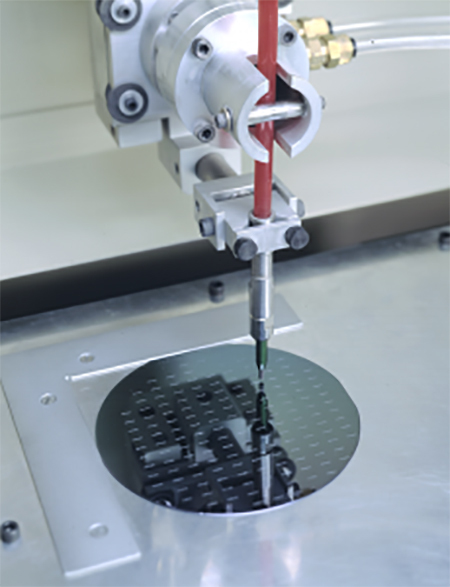 This via must be drilled into the middle of each silicon wafer segment and its shape is critical to flow of ink to each nozzle. MicroBlasting cuts an organic shape in a silicon wafer, improving the fluid dynamics of the ink flow. Even better, a micro-abrasive stream can drill without generating heat or vibration, limiting the formation of micro-cracks.